Happy Friday everyone! Hope you had an awesome week! The weather has been absolutely stunning this week and we’ve been taking full advantage of it! This week has been a bit busy – here’s what our Friday Five are! I’ve linked up with some other fabulous bloggers in the tab above – feel free to join along! 1) Sweatshirt Weather! – I’m a sucker for a fabulous sweatshirt. I’ve been looking for a good fabulous quirky sweatshirt and I think I found it! 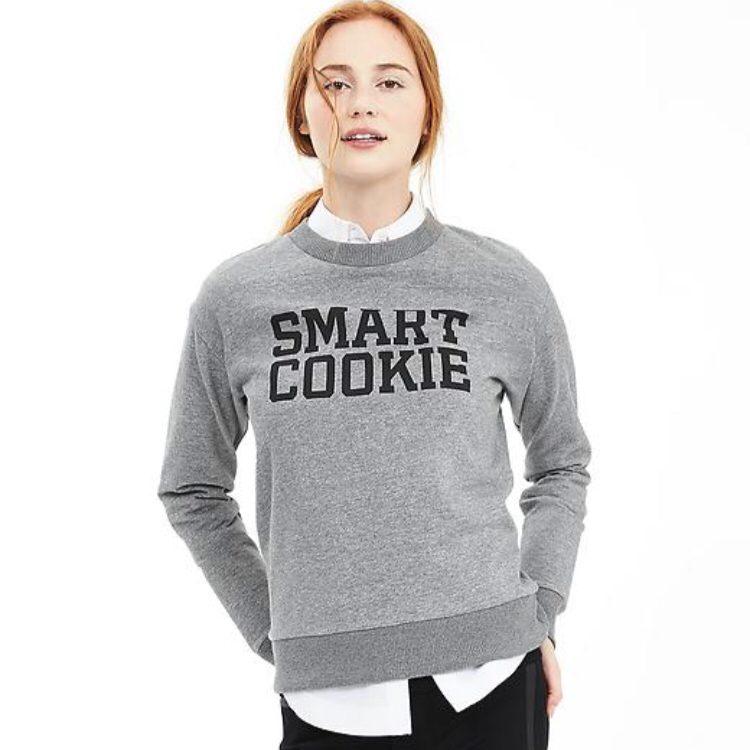 The Smart Cookie is too cute. There is even a pouch that would be perfect for wipes and Hattie things in my purse since we’re not always carrying a diaper bag now. 2) Zucchini Tots & Pickled Peppers! – My CSA Basket was a little out of control this week with zucchini and banana peppers and I had to come up with a way to use them! Skinny Taste to the rescue! These turned out awesome. This has cheddar cheese in them, but next time I may use mozzarella and have marinara for dunking. Definite winning recipe! Then I had a few lbs of banana peppers and I decided to fridge pickle some peppers. I made a jar for me and one for my mom. I’ve had these cute stickers from TinyPrints for years and I always get excited when I can use them. I mushed a couple of recipes together so we’ll see how these turn out! 3) Miss H’s First Trip to Ted Drewes – Thursday night we went to Ted Drewes to celebrate my Grandpa’s birthday. He’s been in town for the week and we had to do something “St. Louis”. Miss H was having a rough day with teeth so she wasn’t thrilled with being out late, but after a little Advil she was in good shape. She just ran around sampling everyone’s custard. 4) Jammin’ at the Zoo! – Wednesday night was GNO but turned out to be a party of 2 as BFFie wasn’t feeling good. My cousin, Marcy, and I decided we were going to go anyway! Jammin’ at the Zoo is a wine tasting all around the zoo. We’ve gone in the past and it is always so much fun. I always love having a reason to wear my Cynthia Rowley dress I got. My necklace was the deal of the century on Amazon – you can’t pass up a Kendra Scott for $20! The flamingos were out and gorgeous! Apparently we felt Kali needed some wine. There were a lot of misses. We even tried a blue wine. Which – don’t ever try a blue wine. No. Just No. Kali was out and a major cheese! He definitely was putting on a show! The Stingrays were open as well. I don’t like touching gross things and Marcy insisted I do it. I was so grossed out. I did it though. Then we went to Katie’s Pizza & Pasta and I got my favorite Potato Pizza. It is so good! 5) Meet & Mingle – Ever have weeks where feel like you got all your stuff done and you didn’t? Well, I forgot to let you know about the Meet & Mingle that Kaitlyn was hosting. She featured me last week and my rude self completely forgot to say thank you to her. Definitely check out Kaitlyn’s blog – it’s adorable. And thank you for sharing a little bit more about me! If you’re interested in joining her Meet & Mingle series, shoot her an email! Jammin' At the Zoo sounds like such a fun event! I wonder if there is anything like that where I live! The Zucchini Tots look fantastic! And the pictures of Hattie eating custard are adorable. Have a great weekend!